More Britons are choosing Jamaica as a holiday destination, according to tourism officials in the country. New figures released by the Jamaica Tourist Board show a year-on-year jump of 6% in the number of tourists from the UK heading to the sun-kissed destination in the Caribbean between November 2013 and February 2014. Ocho Rios, Negril and Montego Bay are some of the most popular places to visit on its shores, while Doctor's Cave Beach, Runaway Bay and Treasure Beach are among the best beaches on offer to holidaymakers. Elizabeth Fox, Jamaica Tourist Board's regional director for the UK and north Europe, is confident the figures will be more than just a flash in the pan, citing new hotel openings and increased cruise offerings as something that will keep Brits coming to Jamaica. She also claims that more flights to the country from the UK will help it attract high levels of visitors moving forward. One of the main pulls for tourists is Dunn's River Falls. Here you can kick back and relax in the pools created by the waterfall. Countless white sand beaches, crystal clear ocean and spectacular rainforest also play a part in attracting global travellers. 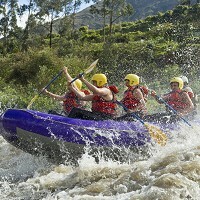 Holidaymakers seeking an adrenaline rush can enjoy a host of activities, including white water rafting, kayaking, zip lining and quad biking, while those after a relaxing time have plenty of hammocks to choose from. If you're one for adventure, make sure you protect yourself on your travels with sports travel insurance, which covers you just in case the worst happens while your away.